MarinePure is an inert ceramic material with open flow architecture, extremely high surface area and natural wetting properties. 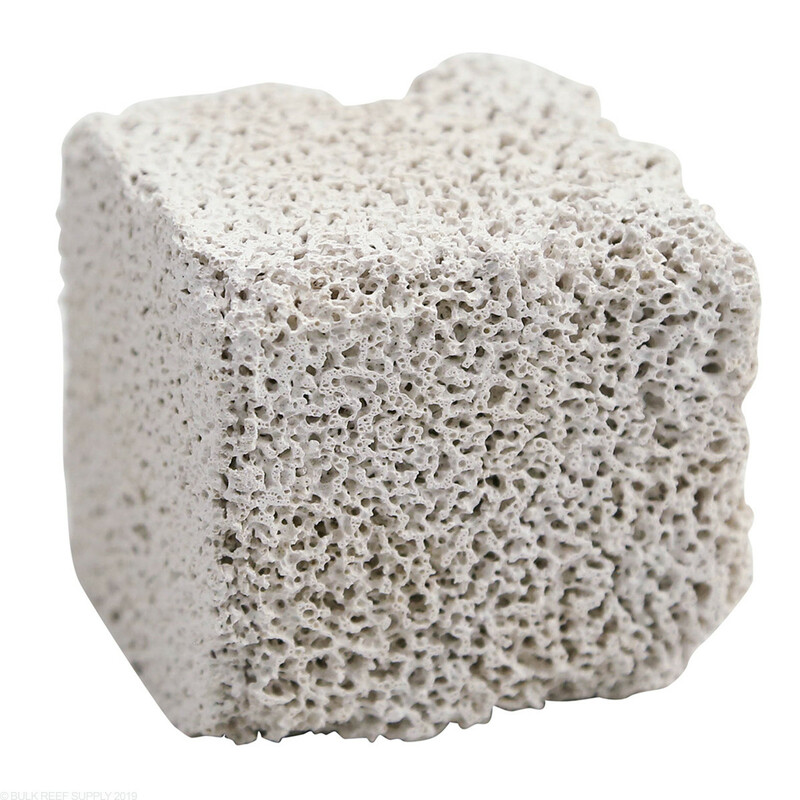 A Single 2” Marine Pure ceramic cube has 720 square feet of surface area. This means you can fit almost 60 times the surface area in the same space verses bioballs. 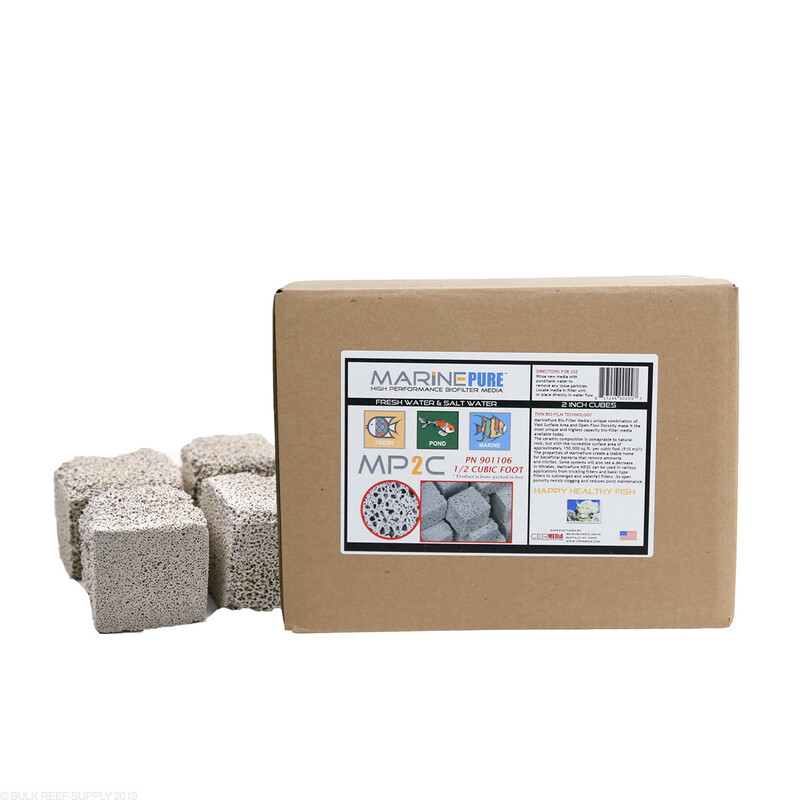 MarinePure is available as 8”x8”x1” Plates, 8”x8"x4” Blocks, or 1.5" spheres. Due to the fragile nature of the MarinePure Cubes we are unable to guarantee that every peice will be an exact cube in shape. 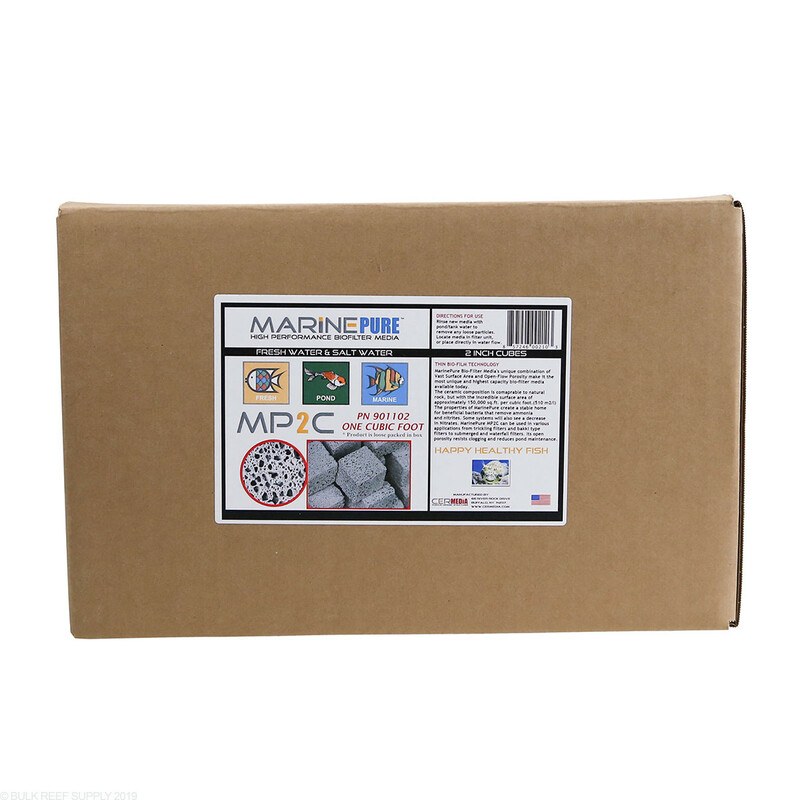 During shipping and Handling the cubes can be misshaped or damaged which will not affect the overall performance of the MarinePure Cubes. We highly suggest rinsing the cubes before use. I too thought the 1/2 cubic foot box would have maybe 12-15 blocks. When I opened the box I was astonished. I didn't count them all, but it has to be at least 70 blocks. I have enough to stuff my filter compartments in my existing tanks, plus a half box to spare. 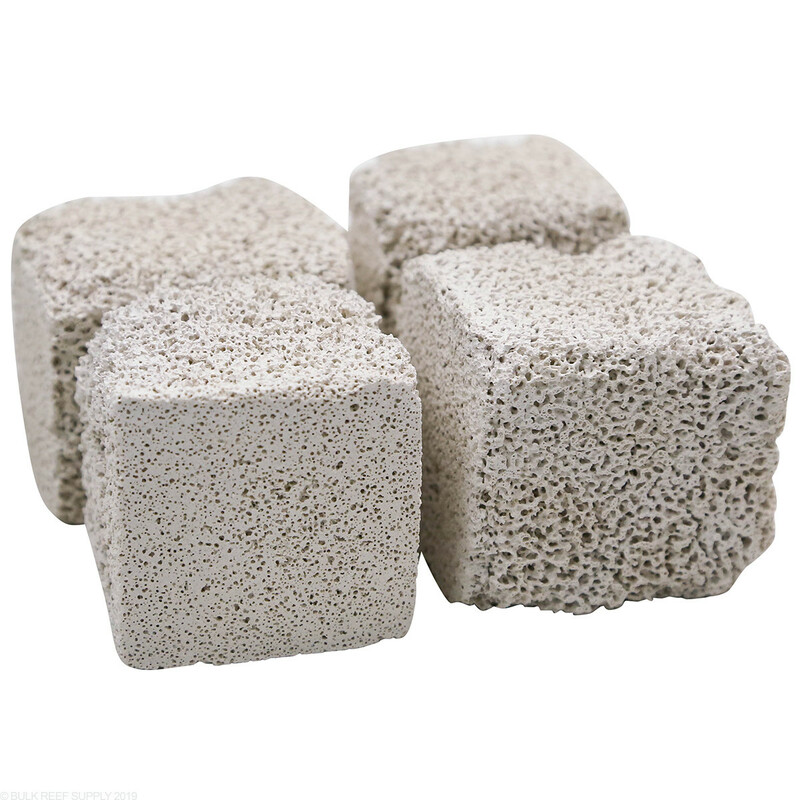 Going off the Q&A for this product I was expecting about 20qty 2" cubes in the 1/2cuft that I ordered. I received 68 full cubes and 10 partial 50%-75% cubes. I had to go back and check the box to make sure I wasn't sent 1cuft by mistake, not the case, I received 1/2cuft. I provided the break down of full cubes vs partials since that seems to be a concern to some people, however I am please with what I received. Since I haven't seen them in action my review is based on first impressions. I've had bio balls in the past, marine pure seems to be a better product hands down. Like other reviews on the other form factors of this product have mentioned - they hold a lot of water. I can also see how people running bare bottom might have an issue with sediment caused by the cubes, for the most part proper location to allow settling in the sump should work just fine. I'm currently setting up a new tank and getting back into the hobby. 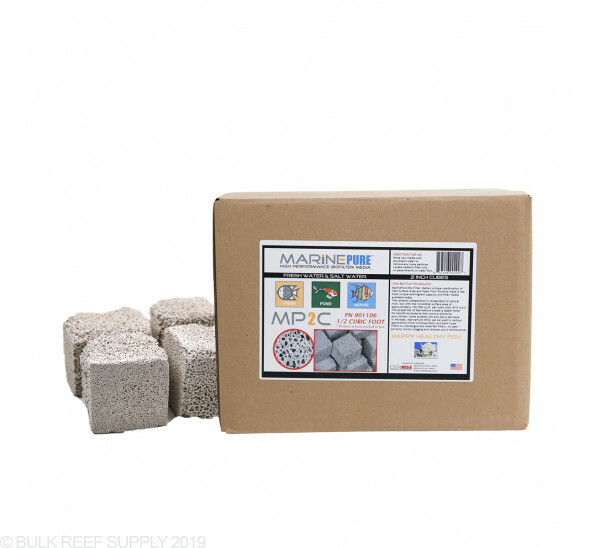 My plan is to fish-less cycle with pure ammonia in a container with these marine pure cubes while I get everything else ordered, setup, plumbed and running. This way in a few weeks when the tank is setup all I have to do is transfer the cubes to the new sump and I should be ready to go very quickly. If this product works 1/2 as good as they claim (and at this point I don't see why not) it'll be the new standard for bio filtration. I will post another review if my opinion should change. I currently use live rock rubble and large pore foam as a transport method to move pods from my fuge directly to the display. This has worked wonders for my mandarins and pipefish. Are pods attracted to these? The Marinepure works amazing as housing for Pods and will be a fantastic addition. Feel free to let us know if you have any further questions! 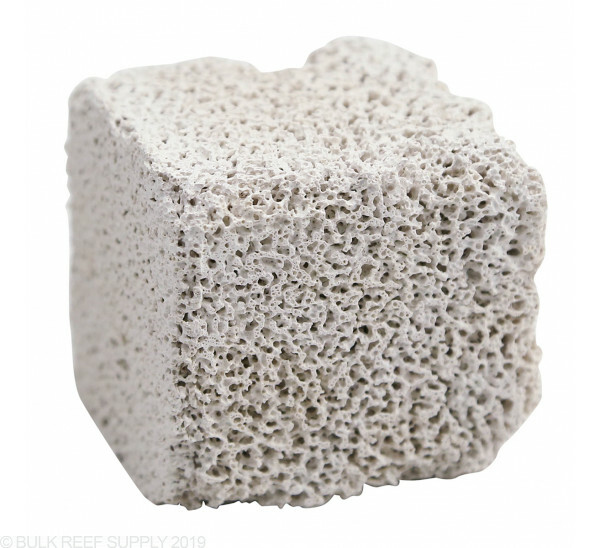 How many 2" cubes come in the marinepure ceramic bio media .The dimensions for my sump are 7 1/2"x9",should I get the 8x8x4 and cut it or use the cubes? These will come with around 20 cubes. The 8x8x4 might be easier to work with as it is a single block. Feel free to let us know if you have any further questions! I have the cubes in my sump. Do u have to clean them over time? Or does it act like live rock? Over time there will be an accumulation of detritus within the structure of the cubes so periodically swishing them in a container of tank water would be a good idea. You should also avoid placing them in an area that would encourage algae growth that would quickly close up the pore structure of the media. Can you list the actual count of cubes per box for each of the sizes you are selling ? Ex. Brings 6 cubes @ 1"× 1"
I looked around and their is some conflicting info on some sites. 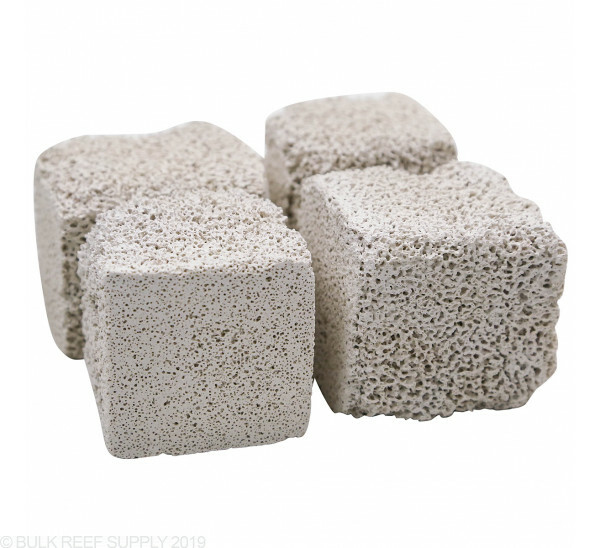 I keep reading about how many square feet each of the various cubes represent, but I'm curious how that corresponds to something like a similar sized piece of various reef rocks, or a similar volume of sand. It's easy to dazzle with numbers "look at how large this number is!" but without a point of reference it's hard to see how useful this is. Also assuming it's super useful, will these majorly restrict water movement? So if I put one block along the width of my sump would water back up behind it? Great question! 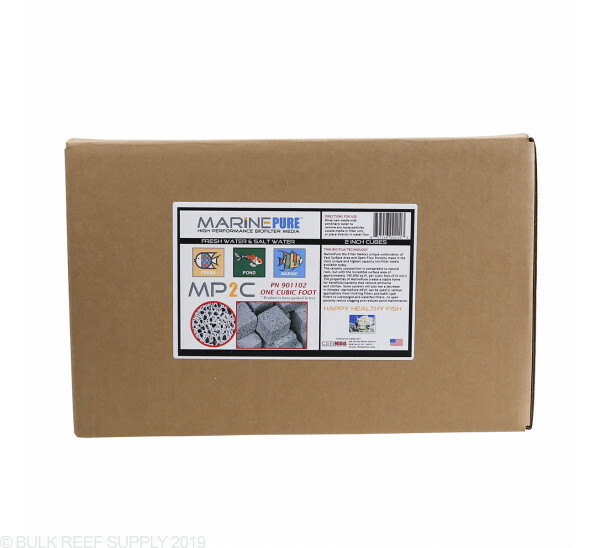 We have made a few videos on the topic as well as included a link below to the technical information as to how much marinepure would be needed per gallon as replacement for live rock. This would restrict flow if fully spread across the sump and in most cases we recommend some access for water to flow around.